With limited intrigue among the Power Five conference playoff contenders this week, No. 11 UCF gets the spotlight as it puts the nation’s longest winning streak on the line against No. 19 Cincinnati. The Knights and Bearcats are the prime-time game on Saturday and ESPN’s “College GameDay” rolls into Orlando, Florida, for the first time. The Knights’ streak is 22 and pushing toward rare air in college football. There have been 26 streaks of 25 straight victories in major college football history. While UCF fans probably are not going to get the recognition and ranking they believe they deserve from the College Football Playoff selection committee, the Knights are lined up for another marquee bowl bid and a shot to take down a highly ranked Power Five team — like they did last season against Auburn in the Peach Bowl. 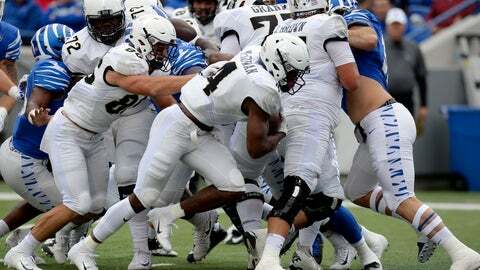 Slip up against Cincinnati and the American Athletic Conference East Division becomes muddled, as well as the race for the coveted spot in the New Year’s Six bowls that goes to the highest ranked conference champion from outside the Power Five leagues. The latest CFP rankings had Utah State 23rd, Cincinnati 24th and Boise State 25th. The Aggies and Broncos play next week in a game likely to decide the Mountain West’s Mountain Division. If the Mountain West and American teams pick each other off, keep tabs on Buffalo of the Mid-American Conference and UAB of Conference USA, both checking in at 9-1. The Blazers could barge into the New Year’s Six discussions by upsetting Texas A&M. Lobos have given the Broncos some headaches with their triple-option in recent years but managed only one victory … BOISE STATE 35-17. Blue Devils QB Daniel Jones has the attention of NFL scouts in what could be a light crop of college quarterbacks … CLEMSON 38-13. Irish will have QB Ian Book back, but it’s RB Dexter Williams who should thrive against the Orange’s shaky run D … NOTRE DAME 35-21. Wolverines have gone to OT with the Hoosiers two of the last three seasons … MICHIGAN 45-10. Sooners have won 13 straight against the Jayhawks, and it has been particularly lopsided lately; average score 51-5 last four seasons … OKLAHOMA 51-5. Cowboys get another shot to play spoiler against a Big 12 playoff contender … WEST VIRGINIA 42-35. Terps have lost QB Kasim Hill to a knee injury … OHIO STATE 31-14. Minshew Mustache Mania … WASHINGTON STATE 35-21, BEST BET. Bearcats have allowed more than 400 yards just once this season; Knights have not been held under 400 since 2016 bowl game … UCF 34-24. In six games since taking over as Cyclones quarterback, freshman Brock Purdy has put up numbers comparable to West Virginia’s Will Grier (13 touchdowns, two INTs, 192.04 efficiency rating) … IOWA STATE 31-28, UPSET SPECIAL. Aggies lead the nation in scoring at 51.3 points per game … UTAH STATE 55-24. Scarlet Knights are only Power Five team to score fewer than 20 touchdowns this season (17) … PENN STATE 38-7. Three times this season the Pac-12’s offensive player of the week was facing Oregon State … WASHINGTON 56-21. Wildcats looking to snap a five-game streak of scoring 17 points or fewer … KENTUCKY 28-14. Buffs’ five-game slide making things slippery for coach Mike MacIntyre … UTAH 31-21. The question for the Seminoles right now is how much fight do they have left? … BOSTON COLLEGE 27-21. Wildcats do one thing at an elite level, averaging 3.1 penalties per game and 28.5 penalty yards, both tops in the nation … MINNESOTA 24-21. In six victories, Bulldogs are averaging 7.7 yards per play; In four losses, 3.6 … MISSISSIPPI STATE 35-13. Aggies were hoping to get a gimme. Instead, Blazers show up allowing 13.2 points per game … TEXAS A&M 24-14. Vols need one more victory for bowl eligibility in Year 1 under coach Jeremy Pruitt … MISSOURI 28-21. Cornhuskers have gained 450 or more yards in seven straight games, a school record … NEBRASKA 28-27. Losing to the worst UCLA team in at least 30 years would be a real problem for USC coach Clay Helton, who already has enough of them … USC 24-17. Panthers clinch the ACC Coastal with a victory. Yes, really! … PITT 35-31.